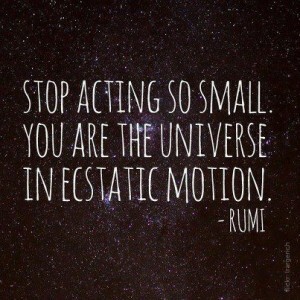 If you’re feeling small, I’m here to remind you of what the great poet Rumi said, you are the universe in ecstatic motion. You don’t have to take my word for it, but if you’re feeling a bit disoriented and need some pointers, I’m offering my services as astrological counsel as part of Belladonna’s annual auction. If you’ve got an accurate birth time, and location, I’m happy to read your chart for you. The natal chart is a beautiful metaphor and map of potentials for your life. Let’s have a look and see what it says. More details here: http://www.belladonnaseries.org/auction/?ult_auc_id=2070. And even if astrology’s not your thing, please check out Belladonna’s auction, there are hundreds of fantastic items: books, artwork, memberships, experiences, wonderful gift ideas. All proceeds support Belladonna’s important work. Since the election, Belladonna has begun to discuss how we can use our resources toward sanctuary and continue our independent, feminist work of amplifying radical and non-normative voices so seldom represented in the mainstream culture. You can help. 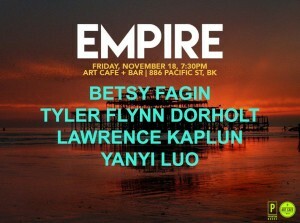 Thanks to the good people at Empire, I’ll be reading November 18th at 7:30 pm with Tyler Flynn Dorholt, Lawrence Kaplun and Yanyi Luo at Art Cafe + Bar, 886 Pacific Street in Brooklyn, NYC. Come join us.